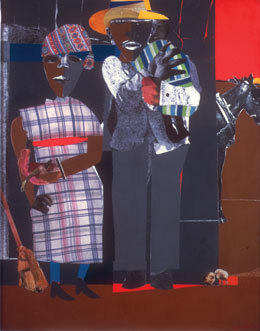 FENCES was inspired by the Romare Bearden collage, Continuities. The Lower Bottom Playaz, the oldest North American African theater troupe in Oakland CA is presenting FENCES as a part of its commitment to August Wilson’s Century Cycle. FENCES is perhaps the most familiar of the 10-play cycle written by America’s Shakespeare, August Wilson. The play which puts The Lower Bottom Playaz over the half-way mark in their history making march through the Century Cycle in order of decades presented in this historically inspired theatrical Cycle (also known as The Pittsburgh Cycle), also literally crosses the bridge from the first half of the twentieth century to the second half, while in characteristic Wilson style offers us a lens to examine the current moment in the history of North America. The themes in Wilson’s Fences while focused on the North American African narrative gives voice to universal issues, those of fathers and sons, husbands and wives, and the force of the outside world on our inner lives. Although the play is nuanced through the lens of the North American African the work has universal appeal that is as enduring as the details of the specifics of the North American African experience of Post World War II America. Wilson gives us a picture of America 6 years before Martin’s I have a Dream speech, he offers us a portrait of America on the verge of the Civil Rights era, through the eyes of a people caught between the history and dreams of the past and the yearnings of a present generation straining to write its own page in history. We are given a space to consider the dreams of fathers and sons as we consider the dance of future optimism along side the wisdom of stories of lived realities. Must the past stand in the way of the future, can the future ignore the past, what does responsibility to self and community look like in spaces of shifting lived realities. What does the path to success in American society look like for North American African men who have had investment in institutions such as the military, organized sports, or entertainment as the paths offered to enfranchisement in the American public sphere? Do these remain the avenues to 21st Century success? In reality none of these institutions or enterprises has allowed more than a few individuals to prosper while the great majority continue to struggle to find equity in the receding shadow of the American Dream. There are examples to be cited that instruct us that investment in these institutions has failed to provide entry into the public sphere and that unsuccessful attempts at assimilation by any means often leads to bitter disappointment in the face of systemic safeguards to successful assimilation into a system has demonstrated the intention by letter of law and repetitive deeds to thwart your thriving. In FENCES as in the reality of life today in the 21st Century the world is on the precipice of radical change, it is a time of great invention and great inequity, and yet for many the only measurable markers of change are the music and fashion inspired by youth who want to find a way on to a front page of American history from a vantage point of a present day that we could not have conceived of a few decades ago. The central character in FENCES, Troy Maxson, has been compared to Willie Loman from Death of a Sales Man. Here is another American everyman, responsible to the things and people who shape his life in spite of life’s ups and downs, he is the best man he knows how to be, he is dutiful to life and the debts he created by living, yet he longs for something bigger than the narrow confines allotted him for his song of himself. His flaws find purchase in his human desire to be the hero in his own life if nowhere else. Troy is everyman affected by the same things that affect all men – love, honor, beauty, betrayal, and duty. A great beauty in Wilson’s work besides his ability to consider the past in a way that consistently illuminates the persistent issues of the present moment, are the ways the simple stories of ordinary people are amplified to lend the way to the creation of space for the consideration of humanness in a universal manner. His work, situated largely in the Hill District of Pittsburgh Pennsylvania holds great significance for urban audiences nation wide as his chronicles of the Hill District intersects with stories of industrialization, modernity, migration, identity formation/reformation and gentrification across 20th “Century America. West Oakland CA shares some of the circumstances that shaped the creation, lived reality, and eventual gentrification of Wilson’s Hill District. His work offers a wide-angle look at the history inside the history of North America from the lens of the invisible. Troy is a garbage man who settled for what was offered him and attempted to build a life by burying his dreams of something bigger. His struggle to do his duty to his family and especially to his sons is the struggle of the past to clear a path for the future. The imperative to survive along with instructive history has lead us to the dilemma of how one imparts the skills necessary to survive to the next generation when one suffers from systemic containment. That is Troy’s dilemma in FENCES and the problem of the 21st Century inner city parent where we teach the tone test to young black men in order to help them survive inevitable interactions with the police. We struggle to define what manhood means in a system that has made access to the things we define masculinity by problematized by unequal access to suitable education, disproportionate involvement in the carceral system, and the lack of employment opportunities in the ghettos created by the American way of life. In these respects FENCES and indeed the entire Century Cycle hold a topical relevance for West Oakland CA and other spaces that hosted North American African migrations and experienced the process of gentrification of those spaces. Image | This entry was posted in August Wilson, Black Arts, non fiction essay, North American African Perspective, Performing Arts, Tales of Iron and Water, Theater and tagged African American, august wilson, ayodele wordslanger nzinga, blk arts, Fences, hill district, lower bottom playaz, North American African Theater, Pittsburgh, Romare Bearden, short essay, The Century Cycle, the ground on which I stand, warrior art, West Oakland CA. Bookmark the permalink.